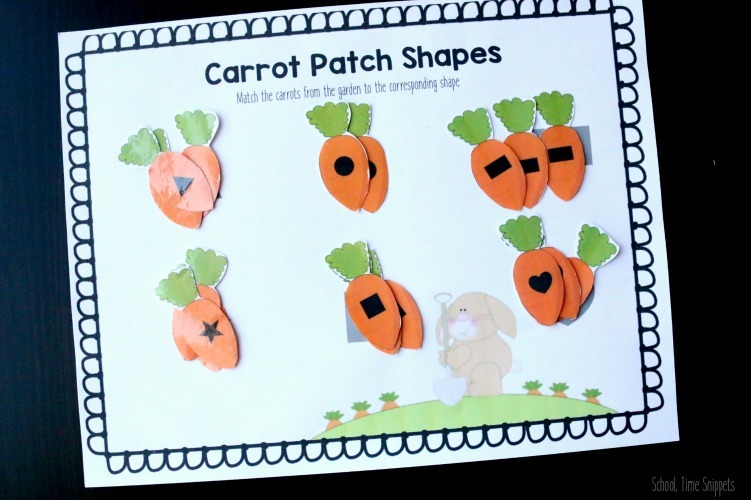 Read the classic tale, The Tale of Peter Rabbit and then set up this fun shape matching carrot patch for your toddler or preschooler! Your child can pretend he/she is a mischievous little bunny picking carrots from Mr. McGregor's garden! This activity is an adorable and inviting way to work on shape recognition, fine motor skills, and counting. First thing first, read the story! Grab a copy of The Tale of Peter Rabbit from your library and enjoy reading about the adventures of Peter Rabbit. 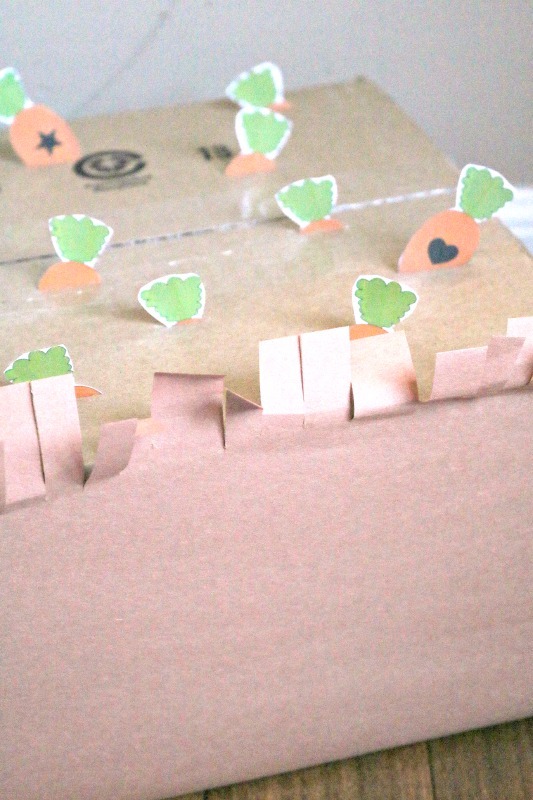 Next, set up your own carrot patch garden using a recycled box. This fun, hands-on spring shapes activity is a great way to sneak in working on those fine motor skills! First print out the carrots and shape matching sheet. Use one laminating pouch and laminate the page of carrots. If you desire, laminate the shape matching sheet, too. Not gonna lie, the tedious part of this activity is cutting out each of the carrots. There are three carrots for each shape. 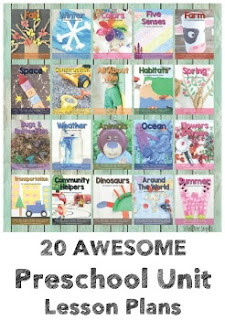 You can just use one of each shape or all of them and sneak in a bit of counting practice, too!! Once the carrots are laminated and cut, time to put together your carrot patch!! Grab that empty box that you've been saving (for who knows why!!) and put it to good use! Turn it upside down and using a knife cut a slit big enough for the carrot to fit into; close to 1 inch long. Another option is to use an empty egg carton. However, save that next box to try our Simple Fine Motor ABC Matching Activity! To finish the carrot patch for you child to play, simply insert a carrot into each slit. Push it down into the slit just so that the carrot top is showing. 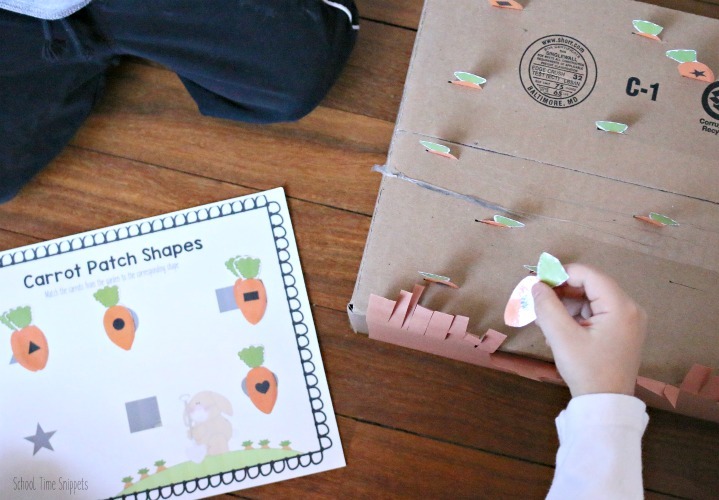 This activity will get your kiddo working on his/her pincer grasp, eye-hand coordination, bi-lateral movement to match the carrot to the Carrot Patch Shapes worksheet. Now, invite your kiddo to pretend he's a bunny in the garden! 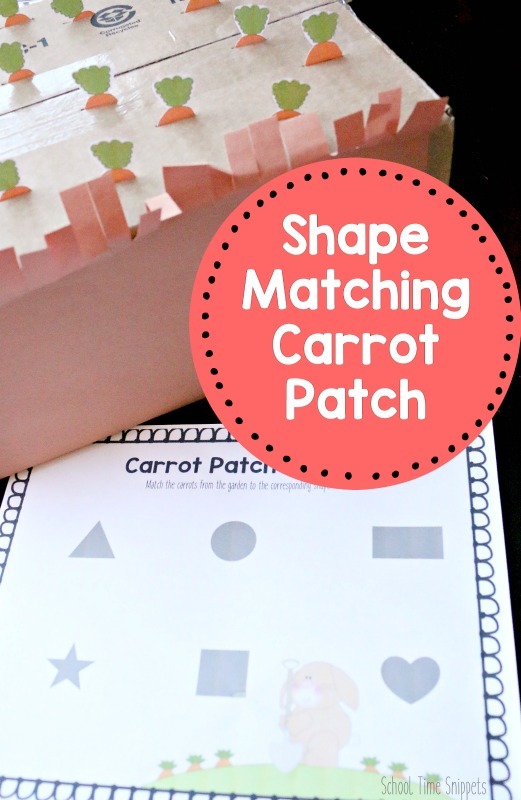 Have your child pull up a carrot, identify the shape, and match it to the shape on the worksheet. Continue pulling up carrots until they are all gone. Your child will identify triangles, circles, rectangles, stars, squares, and hearts. 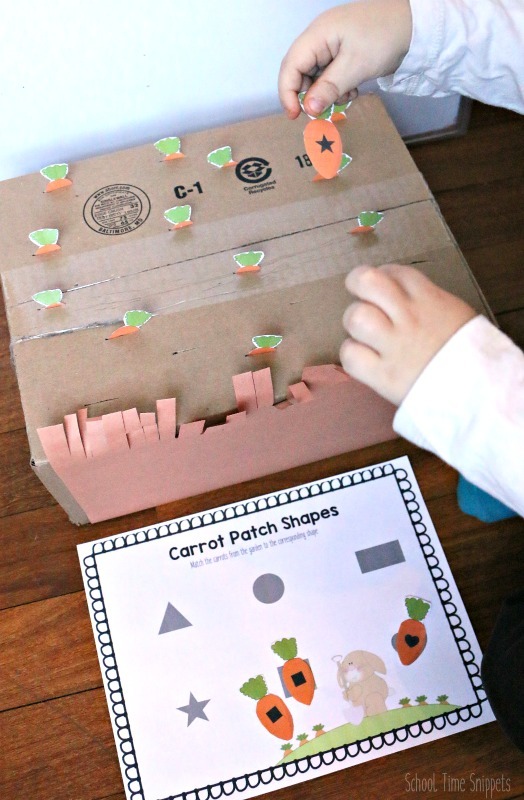 Another great way to work on fine motor skills is once all the carrots have been pulled out of the carrot patch, work on "planting" them again by having your child insert the carrots into the slits. My 3 and 5 year old have played with this carrot patch several times! It's been a great, hands-on activity to just leave out and allow for some playful learning to happen! do not alter, sell, upload the direct link, or claim activity as your own. 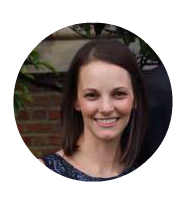 please direct readers to this blog post by sharing via Facebook, Pinterest, etc! Thank you!